Hello Dear Readers - We get reports of Wolf and Coyote sightings daily, and usually those reports are easy to categorize as either a Coyote sighting or a Wolf sighting, but occasionally, we get reports of Wolves, where Wolves shouldn't be. Knowing that Wolves typically live in areas north of Southern Ontario, where there is little human habitation, whereas Coyotes successfully live close to humans, sometimes I do not know where to put these sighting reports. I know that the Grey Wolf of the north and the Coyote which lives right across Ontario, can and do interbreed where there territories meet, and I suspect that the reports below, may be sightings of hybrid Coy-Wolves. Coy-Wolves are animals with mixed ancestry - there are some individuals which look like Wolves but behave like Coyotes, others may look like a Coyote but exhibit Wolf-like bahaviour. The genes of these animals flow both ways - when DNA tested Grey Wolves tend to have some Coyote genes, and Coyotes in Southern Ontario also have Grey Wolf genes in their DNA. Wolves typically "howl" and Coyotes "yip", but what animal does both or either? Perhaps the individuals that are being seen, which look like Wolves, live in close proximity to humans, as Coyotes do. Sandy Wills reported seeing a Wolf near Brock University ... I parked my car at the edge of the parking lot at Brock. It was approximately 6:30 at night. I was planning on walking my two lab dogs. We started walking toward the woods when a large Grey Wolf came out of the tall brush. I quickly put the dogs into car as the Wolf slowly strolled in our direction. I put my high beams on and the Wolf came into my plain view. It stared into the lights for at least a minute then strolled away back into the bushes towards the woods. It was so eerie when it just stared into the lights and it was huge. Quite a beautiful sight when it walked back down the snow covered road. I'm extremely thankful I did not walk down that road. I went home and looked up Wolves, and what I saw was not a Coyote, it was most certainly a very large Grey Wolf. Richard Finch wrote to report ... On 22 January 2016 while walking east on Gore Road between Wellington 35 and Foreman Rd., I saw what I am certain was a Wolf on the southern side of Gore Road. I have seen many Coyote, and this was distinctly different. It was an extremely large, majestic animal with a healthy silver coat and conventional Wolf markings. It briefly followed a fence line separating an open field and a forested area. Once it reached the end of the fence line, it crossed over and trotted into the woods. I eventually lost sight of it. I subsequently examined the very large tracks in the snow and it seemed apparent that it was tracking a rabbit on a similar course. Such a wonderful sight. Kathleen from Souffville wrote to report ... I heard it a few nights ago on January 7 2016, it was really close. We were in Stouffville at 9th Line and Bethesda Sideroad. Patricia Young from Ridgeville, Ontario, wrote ... This morning I was looking at my window trying to decide if I would start to cut the trim around my property. This dog-like animal came trotting out of the woods, but literally by the time I jumped up off the couch and ran to the window it had disappeared among the bushes along the fence line. To clarify that I was not seeing things I searched the internet and found this web site. Yes, it is a Wolf most likely living in the forest behind my house. No time for a picture it was too fast. Question: should I be worried because I have a large property in the Niagara area and I have to cut the grass. I also noticed there are fewer deer on my property this year and I am wondering if this is a result of a Wolf family living in the forest? One of our readers wrote ... My mom just went to take my dog out in London, Ontario, tonight near Woodland Cemetery. She came in screaming that a giant white husky was out there that was watching and waiting, but took off at the last second. I ran out, hoping that if it was a husky I could call it. It went in the direction of the cemetery. I searched for it, gave up and came in. I went over the description of it with my Mom and it started to seem too big for a husky. Without explaining, I showed her a picture of a Grey Wolf and asked if that was it. She's pretty positive that is what she saw. It could be a very light coloured hybrid, but it wasn't a Coyote. We've seen them before. What's weird is I could've sworn something has been living in the ravine that connects Woodland Cemetery, Springbank Park and Trowbridge Ave ... and that's the direction it headed. One of our readers from Brechin, Ontario, wrote ... We hear Coyotes howling every night throughout the year and see them frequently in the winter on our 12-acre property. They especially enjoy howling at the trains that sound their horns at frequent rail crossings nearby. In recent months they have been visiting the property in packs which leads me to believe they are Coy-Wolves rather than the more solitary Coyote. I didn't get a photo but he / she stopped long enough for all of us to get a good look, then he bounded off into a field and disappeared. I feel very fortunate to have seen this magnificent creature in the wild. Last December Crystal Matthews from Nanticoke reported ... I had the most amazing sighting of a lone black Wolf, it was huge! Really quite the sighting as it was walking across a field one concession past Rainham Road on Cheapside Road heading toward Rainham Road. It was definitely favouring it's right hind leg as he walked with a limp. I was really shocked to see a black Wolf as I've never seen one before. I just thought I'd put a warning up for all the farmers around. Jake from Delaware wrote to report ... Driving back from my friends house in Delaware on Sunday May 31 2015, I spotted a deer running on the side of the road so I slowed down, then I spotted a large canine that was primarily black. This was not a pet nor a Coyote. It looked identical to a Grey Wolf. This doesn't make any sense since this was 10 km west of London, Ontario. Andy from Ancaster, Ontario, wrote to tell us ... I was driving along Stone Church Road, just off Golf Links one morning last summer, and what was running along the roadside only to leap over the barrier, was a Wolf. This was not a big Coyote or big German Shepherd. A Wolf. R. K. from Hamilton said ... On January 13, 2016 at 4 pm, I observed a Wolf crossing a North bound ramp leading onto the Red Hill Expressway (near Barton). Once it jumped over the concrete barrier the Wolf headed for the cover surrounding Red Hill Creek. It had a thick coat and a broad snout. Bailey wrote to say ... I heard howls in Simcoe, Ontario, at 11:15 pm on October 20. It's very quiet in my neighbourhood, which is about a five minute walk from a field and forested area. I was serenaded by many yips and howls - I've never heard anything like it before! Saw a wolf this morning around 10:30. He was in a field on Cheapside road and Concession 2. Just saw a Wolf or a cross-bred in the Alliston, Ontario, area. Any place to post the picture? Yes, you can send the picture and this info, to us by using the form on our Wolves section. Please include where you were, what time of day you observed this animal, what it was doing, or any other info that you think might be. interesting for our readers. Jon here from Haldimand county. I have been hearing and seeing Coyotes/Coywolves for the last few years that I have lived here on a daily basis. I have a game camera that I set up and have literally 1000's of photos, solitary coyotes, breeding couples, young ones you name it. Recently though, July 2017, I have been hearing a howl that is much louder and deeper than usual. My property is surrounded by bush and farmland and is ideal for these animals. The last time we heard it we had visitors over and they wouldn't even sit outside anymore. That's what got me searching on the web and on to your site. I think we have a Wolf around here. I've set up my cam again in hopes of catching it. Thank you for sending me this info, Jon. My daughter and her family lived in Thorndale for a while, north east of London. A few years ago they told me that they had been hearing Coyotes for the ten years that they had lived there, but now and again they heard something completely different - a canid that wasn't yipping, but was giving a deep, long howl. People say that there are no Wolves in Southern Ontario, but I'm not sure. If you want, you can send me some of your pictures and I would love to publish them on my website - you can use our "Contact Us" form to send me your email address and I'll reply so that you can send them to me, if you like. My Husband came home this morning, talking about spotting what he thought was a wolf near his work, he said it was white silver in colour and had similar look to a husky but larger, he also stated the animal did not run like a normal dog, it bounded off more like a deer. This animal was spotted on Commercial Crescent just off Third Street in North London, there is not much bush in that area, so I thought it would be strange to see a wolf in the city like that. He didn't get a picture but I hope he does if it comes back, they seem to hang out in that area, as he has heard howling at night there as well. As I have told my adult offspring - nothing good happens after 1:30 am. You be the judge here. Mopping/sorting out a slightly flooded basement - New Street area in Burlington - just east of Marilus (grocery store). Go to cross the road near the Tim Horton's in Eastway plaza and from the west I see several shadows cross the road to the south side. Seconds later one coyote goes by me and then crosses the road again. Seconds later two more come running past me at breakneck speed and cross the road like the first. The trailer coyote was partially hit by a car (I was sure he was not going to make it) and after a brief stop in the parking lot - it pushed off not looking too injured. Thirty seconds later a fourth coyote came by me, again on the south side of New Street - and it crossed back to the north side like the three previous animals. I was stunned at the speed these animals came past me - and certainly they could have feasted on me if they wished! Likely coyote? Wolf? 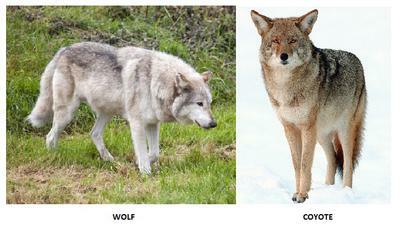 Or Coywolf? I suspect the first, but very interested in comments. Just moved into a new place and came to my house to notice a full grown Wolf standing on my property - he didn't want to leave. On 7th concession in Harley last night I heard a very very loud amount of deep barking and a howling. When I popped my head outside to hear it better, it sounded so close that it might have been in the field just outside my house. I spent all night and this morning trying to find out if it's possible it could have been a wolf in this area, I can't imagine that sound coming from any dog or coyote. Concession 3 at Liberty very close to house, woods across the street. It was so loud woke us up. Definitely more than a few of them. Hear them near and after howling can also hear some answer further away. Sounds beautiful but scary all at the same time.